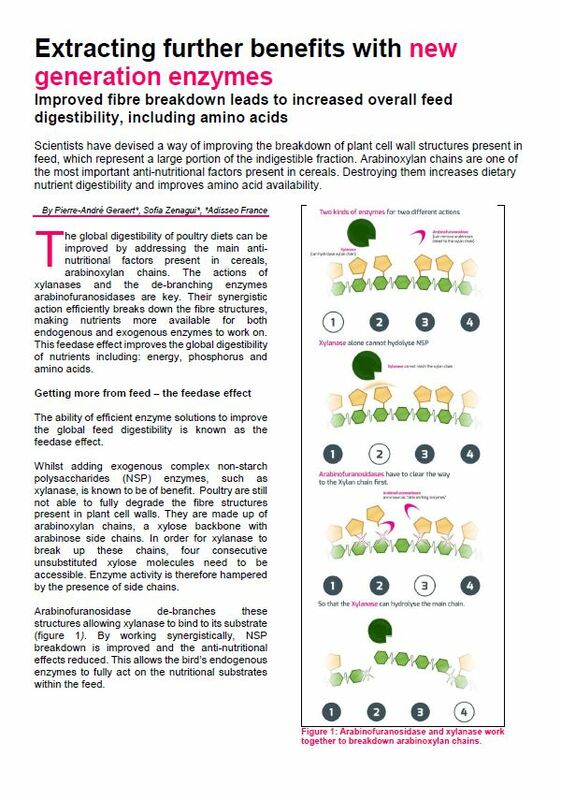 Soluble NSP are known to possess anti-nutritional properties by either encapsulating nutrients and/or depressing overall nutrient digestibility, through enhanced viscosity and changes in digestive microbiota. The cell walls of the outer tissues of the cereal kernel mainly contain cellulose and complex xylans, together with significant amount of lignin. The cell walls of theendosperm however, contain almost exclusively arabinoxylans and beta-glucans. Arabinoxylan is one of the main NSP component in cereals. It is composed of a beta (1-4) linked xylose backbone carrying arabinose residues at the C(O)2 and/or C(O)3 positions of the xylose residues. Ferulic acid or even more complex side chains can also substitute the xylose residues: including (feruloylated) arabinofuranose, xylose, galactose and glucuronic acid. Due to their narrow specificity towards one linkage, different enzymes are required for the degradation of arabinoxylans. While endoxylanases hydrolyze the xylose backbone, their activity is frequently hampered by the substitution with arabinose residues. 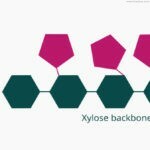 Indeed to be efficient, most of theendo-1,4-b-xylanases need a long enough stretch of unsubstituted xyloses on the xylan backbone (Lafond et al., 2014). a-L arabinofuranosidases (ABF) are GlycosylHydrolases able to cleave arabinose from the backbone. Therefore, they are an important actor of the hydrolytic system to degrade hemicelluloses such as arabinoxylans, arabinanans and arabinogalactans. 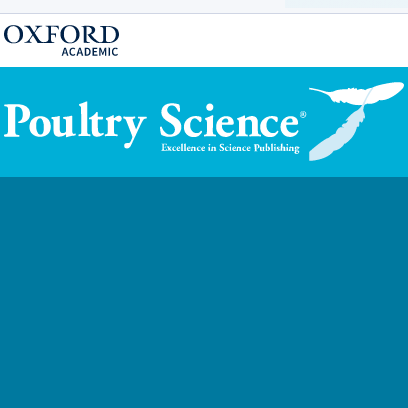 Belonging to different GH families GH43, 51, 54, 62,… are able to release arabinose from mono or di-substituted xyloses in oligo or polysaccharides. 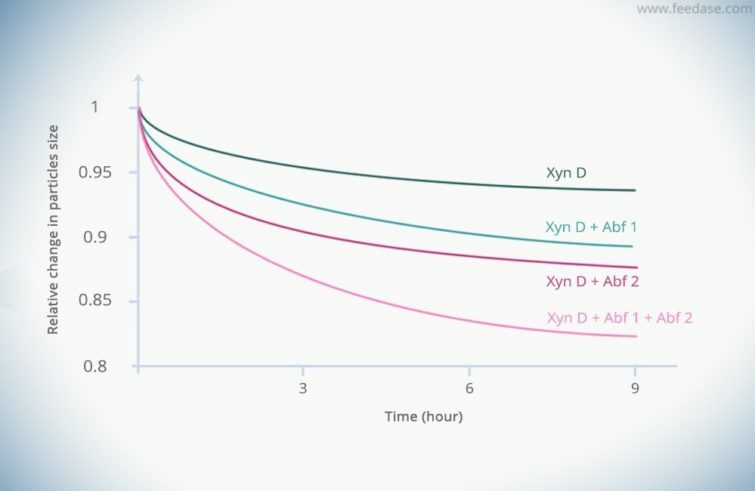 Moreover, the main characteristic of ABFase is to have a lower optimal pH than endo-xylanases. The direct consequence in the digestive tract is that the debranching action occurs in the upper part (stomach) while the endo-xylanases will act further down along the digestive tract. The bar char below shows the boosting effect of removing the substitution with the ABF to degrade arabinoxylans as measured by the viscometric method. 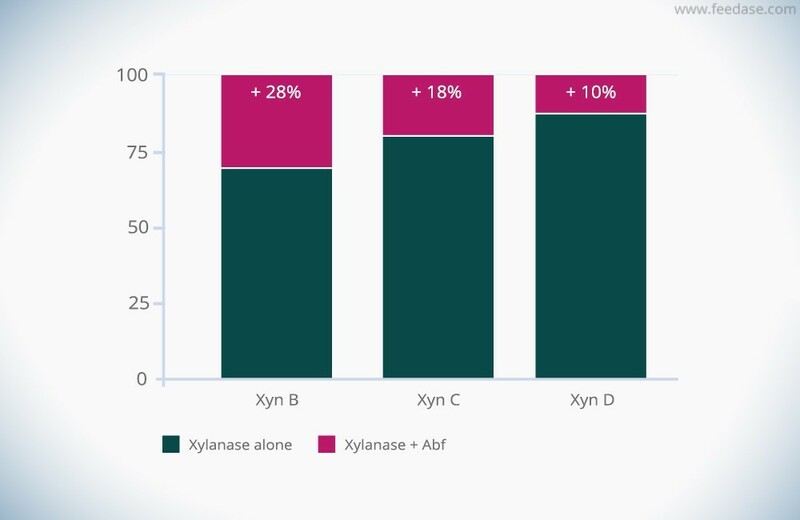 Indeed, whatever the single xylanase obtained from the fungus Talaromyces versatilis (Xyn B, C or D), the complementation with even only one ABF (Abf 51a) improves the xylanase activity. Adding multiple arabinofuranosidases to one xylanase enhances insoluble arabinoxylan particle degradation as shown in Figure 3 thanks to a toric reactor and a CCD camera. The best results are obtained with a combination of two arabinofuranosidases to the xylanase D (see the curves char below).